I was really excited about visiting the relatively new Beauty Mart at Harvey Nichols. Having spent copious amounts of time in the Selfridges Beauty Workshop area in their Oxford Street store I was thinking Harvey Nichols would have created a space to rival Selfridges. Firstly I couldn't find it. The girl I asked in the store on the same floor it's located on didn't know where it was. When I finally did find it, it seemed like an afterthought, shoved in the corner, badly set out and with a girl who didn't seem to know what day it was never mind be able to spout fascinating facts at me about their products which would instantly make me go 'I'll take one of those please'. Selfridges has this niche market beauty concept nailed. Harvey Nichols needs to catch up quickly. However, I knew what I was looking for and picked up these bits from the Beauty Mart 'concession'. Everything I bought was a new brand for me which is actually quite exciting! Before my trip I'd had a look on the Harvey Nichols Beauty Mart website and picked out this oil as top of my wishlist. The Heaven range is the brainchild of Deborah Mitchell who has treated both Kate Middleton and Camilla Parker-Bowles. This 'elixir' contains organic calendula oil, vitamins A and B and beta carotene and claims to help balance oily skin, reduce breakouts and banish blackheads. You add one of two drops of this to your cleanser or moisturiser to get the magic working. I've seen these Eos (Evolution of Smooth) lip balms in the US and meant to pick a few up in the USA earlier this year and forgot. These are a dome shaped solid lip balm in 7 different flavours and are packed with lip smoothing vitamin E, shea butter and jojoba oil. I've been using mine every night before bed and I gifted one to my best friend Danielle as well and she has also rated it highly. 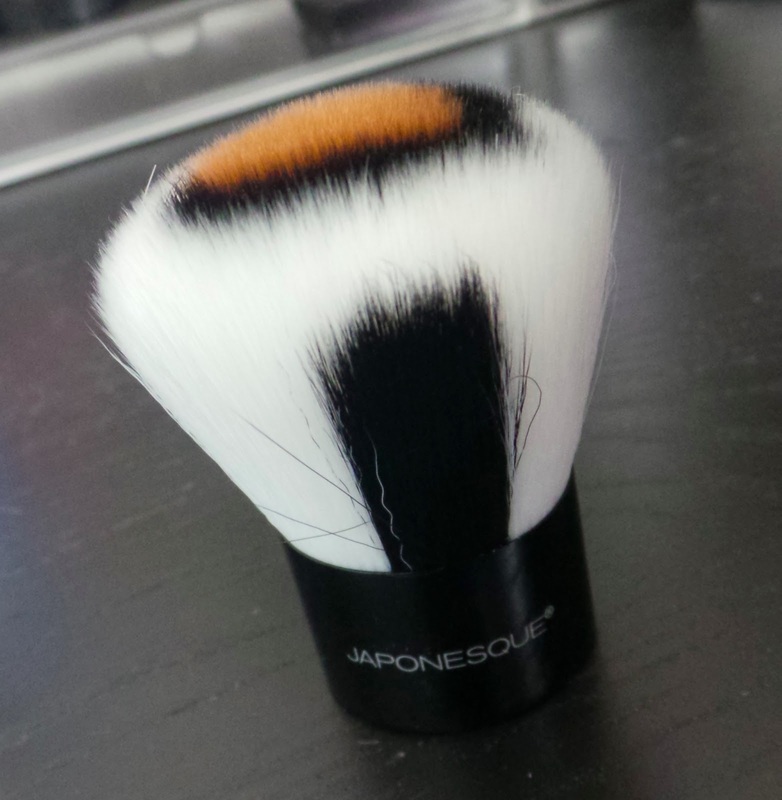 I bought the Japonesque purely based on it's looks! I love leopard print so snapped this up-it's a decent brush-I have been using it with powder to set my foundation in the morning and I don't think I have seen one bristle on it shed. Seche Vite needs no introduction I am sure in the UK but in all honesty I don't know how to use it! It seems you apply it to wet nails but doesn't that leave the brush covered in colour and contaminate the top coat when you put the brush back in? If anyone can leave me a comment telling me the best way to use it I would appreciate it!! I do know it's a fast drying top coat for nail polish and helps to extend the life of your polish. I saw Estee from Essie Button raving about these toning waters. The Rose and Orange are anti-aging and hydrating and contain hyaluronic acid to prepare your skin for moisturiser. Caroline Hirons, skincare queen recommends using two toners-one to take away (exfoliating) then one to add (moisturising) so this will definitely fit in the 'one to add' category. The sad thing is that on the Beauty Mart website there are some really great products but I couldn't seem to find them in store. I was expecting a sprawling beauty haul but actually shopping there seemed to be a real mission and wasn't really a pleasant experience. To top it off, when the cashier ran through my items she proclaimed my bill to be £380!! She had somehow rang each item through 3 times but didn't seem to have noticed her mistake. Thank goodness I did. I won't be rushing back to the Harvey Nichols Beauty Mart, I'll stick to Selfridges.